Economy drive | What Car? Could you tell me roughly how many miles I could expect to get from a new Renault Clio 1.2 TCE Expression if the tank was full to the brim? The 1.2 TCE is capable of 589 miles on a tank. 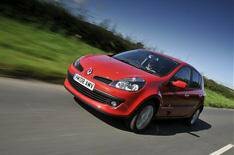 This calculation is based on an average fuel consumption of 48.7mpg and the 55-litre fuel tank fitted to the Clio. However, it is worth bearing in mind that the actual range you manage will depend a lot on your driving style and road and weather conditions. You wont get near that figure if most of your driving is done around town, for example. Rather than squeezing every drop out of your tank, make sure you fill up well in advance to ensure you dont run out of fuel and are left stranded.